Yes, it is Monday. 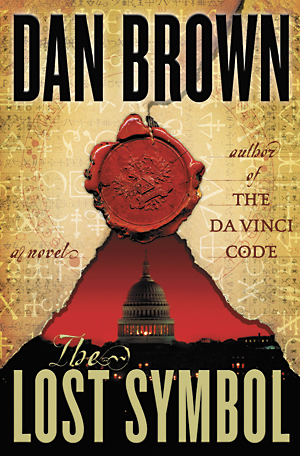 Dan Brown, the author of The DaVinci Code and others, released his newest book The Lost Symbol a week ago. I bought it on Wednesday and finished it on Friday of last week, wrote this review, and scheduled it for Monday so you had more time to finish it. While I’ve warned about spoilers, this is not a review of the plot, the characters, who is who and what plot twists there are. However, scattered through the book and culminating in the final chapters is a concept that needs review and a certain amount of hacking. Read on for more. When I entered the ministry, I got a greeting card from a friend’s parent who had watched me grow up. It was a picture of a sun obscured partially by a cloud with the text “Seeing is not necessarily believing. But believing is seeing.” On further inspection, of course, the cloud had an image of Jesus in it. For those that believe, it seems, it is easier to see Jesus in everything (like potato chips, wall grime, or grilled-cheese sandwich [/snark]). A common theme through Brown’s books has been secret knowledge hidden in plain sight. In art, architecture, and literature, the illuminated read the same words or view the same pieces that the masses see, but see something incredibly different. Once illuminated upon the quest, the hero Robert Langdon builds upon each piece of human art until they all culminate in one expression of secret knowledge…hidden in plain sight. While the cynic in me says that artwork (written, built, painted or sculpted) is evocative of many responses that can easily be crafted into one tangled thread by a gifted storyteller,the Book has several themes that I want to draw out about secret knowledge that are important to talk about. The “Lost Symbol,” (the subject of the book) in the end of the novel, ends up being something right in front of our eyes, in most every hotel in the nation, in every pew in the world. The Lost Symbol ends up being a reference to the Bible, which contains secret knowledge that can transform our world. The novel uses several examples of Scripture which, “properly” viewed, parallels advances in science. If we “believe” and “see” then the secret knowledge will redeem humankind and lead us to heights unknown. According to the novel, this hidden knowledge is in plain sight, and yet has remained only a trickle of revelations over the last 2000 years. By study of the text, we can seek the divine being wrought within us. But in my view, even if we accept the novel’s premise as fact, I feel that the novel fails to accurately place the Lost Symbol. The failure of the antagonist in the novel (in a sense…you read the book, right?) is taking as literal that which is metaphorical. However, the failure of the novel is taking as metaphorical that which is, in my mind, literal. That is, expressed in letters, in words. I don’t think the Bible has secret knowledge ala The Bible Code, the secrets hidden in the Gnostic Gospels, etc. But I do think secret knowledge comes forth from relationships. Some secret knowledge comes from conversations between humans and the Divine (mystics come to mind). Secret knowledge comes from mentoring relationships and transformative experiences. Secret knowledge comes forth like a dam breaking when an epiphany shines a light in a counseling session. In short, The Lost Symbol ends on the claim that the divine is located within the person, light within dark, spirit within flesh, which is a gnostic idea. In contrast, I believe that the divine is located in the space between two persons in relationship. In this way, the divine truly is, in the original Hebrew, elohim, the plural form of God, who made humanity “in our image” (Genesis 1:26), and thus the locus of divine transformation is not within one entity but between two entities. It is this location of the divine that transforms our relationships, that makes us truly evangelists not seeking individual redemption but in the shared space of conversation and conversion lies the true hope for all of humanity’s redemption. It is this location of the divine that makes religion so hard as we have to deal with different icky people with weird beliefs and backwards thinking that somehow, in some fashion, transforms us. Finally, it is this location of the divine that makes today’s political climate of yelling, of mock protests, of calculated outrage, of marginalizing dissent so dangerous. When we seek to end the conversation, finding the divine, unlocking the secret knowledge that will redeem our species edges further from our grasp. Whew. Part 2 is tomorrow. Thoughts today? I am half way through the book, and am really astonished that NO ONE has commented on your post!! When i get to the end, maybe i'll come back and either agree or disagree with you, but u write very clearly! I like the fact that someone finally disagrees with Dan Brown! !